Kim & Brian got married on arguably the hottest October day in Corolla! They rented one of Twiddy‘s event homes – Wish Upon a Star – and hosted both the ceremony & reception there at the home. The backyard area of Wish Upon a Star wasn’t quite large enough to accommodate their headcount so to maximize space, we did a pool cover via Ocean Atlantic Event Rentals which doubled the space! The ladies spent the morning at Lovie’s getting pampered and once ready, Corolla Trolley picked them up and brought them back to the house for the ceremony on the beach. Flower Girls setup their beautiful vintage doors, accented with a gorgeous greenery garland and floral swag for the ceremony and the chairs were setup by I Do OBX Chairs. After the ceremony, guests enjoyed a cocktail hour on the beach including lounges, lawn games and more! The reception was catered by Basnight’s Lone Cedar and guests enjoyed a delicious buffet! Northern Lights Bakery in Corolla baked the cake. The reception decor was also provided by Flower Girls – we opted for simple wooden boxes of blooms with succulent accents & votives. The warm taupe linens with coral & sage accents worked perfectly! After dinner, as guests enjoyed dancing to the music Coastal DJ played – Cosmo’s Pizza set up their mobile pizza oven and guests were treated to stone oven pizza on the spot! 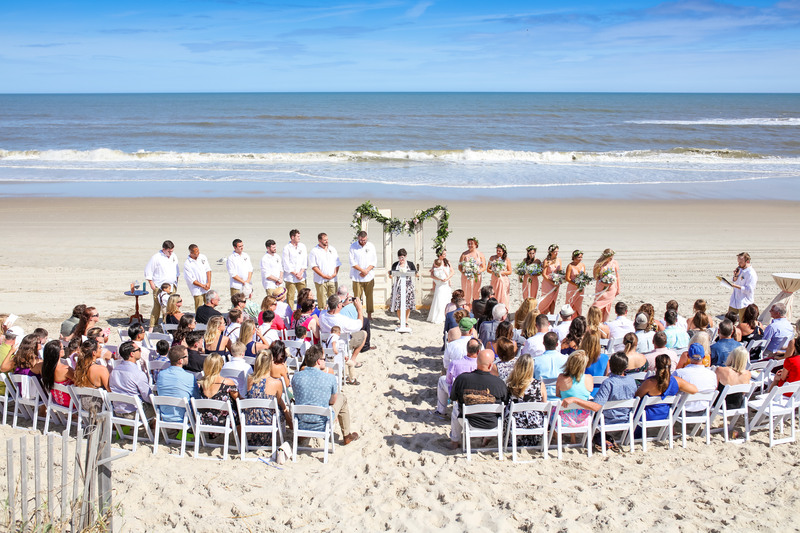 This was such a fun wedding and a great celebration – enjoy the photos from Coastal Shots below!